As monitor resolutions become larger, websites tend to become wider. This showcase features 25 awesome website designs over 1000px in width. Many of these super wide website designs are built as responsive layouts, which allows the designer to accommodate even the largest of screen sizes with the max-width property without chopping off elements on smaller resolutions. Want more similar website designs for inspiration? Check out these Fullscreen WordPress Themes! This is the portfolio of an Italian designer and art director. It makes use of the popular flat design trend and focuses on typography rather than images. Dave is a designer & builder based in San Francisco and this is his portfolio website that features a fullscreen layout and cool effects. This is an exceptional portfolio website with an interactive layout that will definitely get your attention. Michael Schmid is a German Digital Designer & Developer and this is his monochromatic, minimalist portfolio design. It has some nice transitions, so make sure you check it out. This is the website for a creative design agency. It includes useful info about the services they provide, team members, a blog, contact, etc. This is the presentation website of an independent digital agency. It has a fullscreen layout and bold, large typography to catch your attention. This website fills up your whole screen with info. It has a minimalist design and a simple layout. This is the presentation website of a usability, service design & user experience agency that creates ideas and products that transform and grow businesses. This is a creative web design with a fixed menu design, beautiful fonts, full-screen layout, high-quality images, and more. Andrew Revitt is a freelance designer with 15 years experience working in web, graphic, branding, UI and UX design and this is his extremely straightforward, minimalist portfolio. This creative wide website design includes a parallax effect, lovely fonts, a beautiful transparent header with a menu and more features. Forefathers Group is a global design conglomerate that builds responsive branding systems, web design, and web development for brands and businesses. This is their website. It has a wide layout and some vintage-inspired graphic elements and fonts. This is a creative portfolio website with a full-screen layout which takes up the entire space of the browser. iA creates digital products and offers strategic design and consulting services through their UX studios. This is their simple but very effective website design. Smashing Magazine is a website for web designers and developers. This is the layout they use for the posts section of the site. 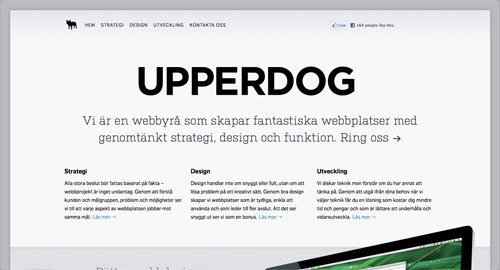 Upperdog is a solutions focused web design and digital marketing agency in Bournemouth, Dorset. They have a very wide website design with large graphic elements and images. This website covers the whole area of your browser with its extremely wide slider and content block. Meltmedia designs and develops websites, web apps, and mobile apps with robust CMS platforms and web technologies. This is their colorful website with a wide layout and a blend of high-quality images. Electric Pulp is a digital agency focusing on Responsive Web Design, Web Development and Mobile eCommerce. They put an accent on large fonts, with bold features and solid color blocks. 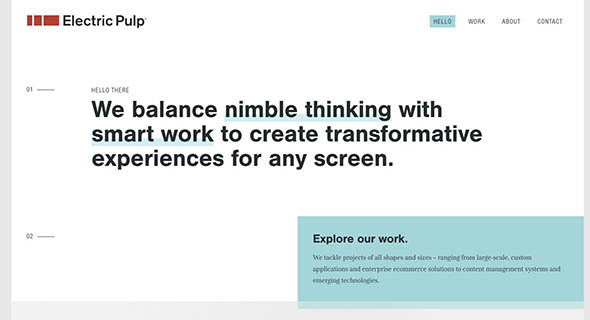 This is a great portfolio website with a simple, wide layout design. It uses a full-screen layout with a transparent header design. You all know this website. It offers tips, tricks, and techniques on using Cascading Style Sheets. They have a grid layout design that covers the whole browser area. This is the portfolio of a designer and web builder. It has a white, clean background and a wide layout for the content area. This is the website to find videos and online courses to help you learn skills like code, photography, web design and more. Their website layout is wide and contains grid sections as well. 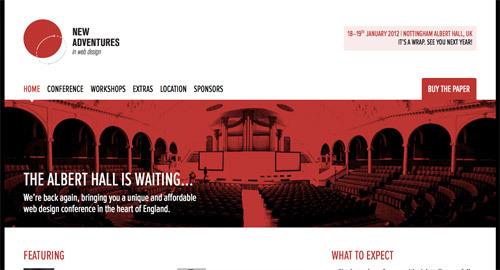 Check out this creative website design which makes use of large, bold fonts to catch the visitors’ attention. It has a fullscreen layout. This is a creative portfolio website with an interactive design and a unique, wide, animated background. The post 25 Examples of Super Wide Website Designs appeared first on Line25.